The book was amazing I wanted more although it left off quite nicely !!! Thanks so much for visiting the site and connecting! It’s always wonderful to hear from a fan. Such a lovely story, actually, two stories entwined into one. I was afraid of an abrupt ending but it was delightful. I have found a new author. Life is good. Thanks for your message! Yes, life is good! i enjoyed these entwined stories very much. The historical mixture with the contemporary Sheila was done so beautifully that I wanted more! The ending was done so well and there is hope for another story with more revelations. Maybe by a creative Sheila researching historical documents and finding what happened to a lost love? Yes! With today’s technology, there is a lot of research that Sheila can access but a trip to Italy is definitely more interesting, no? Bought your book Finding Out through Bookbub. Loved it. Hope there will be the sequel soon. Would have been nice with a little less office politics and more about her relationship with Joe Hopefully will see more background in the future. The historical part was awesome. Keep writing you definitely have talent. Thank you so much for the lovely message! I am working on the sequel. I’m hoping to go to Milan for research. Hopefully that gives you a good hint. I couldn’t wait to come home today to finish. I loved every minute of it!!! Please write more! I was so enthralled with this lovely story. I wish I had a friend like Ruth. She has become a heroine of mine. I was actually very proud of her payback with the wedding gown. Will you write more about her life from 1947? I would love it if she turned the Nazi groom in for war crimes. I love her story and want more. Thank you so much! I am writing a novel that takes place in 1947 and will reveal more of Ruth’s life. I’ll be in touch with more information in a few weeks! I just finished your e-book that I purchased through bookbub. I had not made the time to read a book in two years and this book was a wonderful read. When can we expect the sequel? Is there going to be a sequel to Finding Out? Thanks for reaching out. 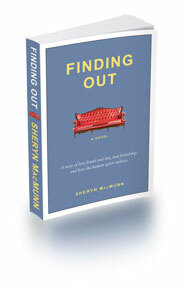 Yes, I am working on the sequel to Finding Out and look to publish this summer. I can send updates, if you’d like.